An Insect Digimon armed with gigantic pincers on its head. Like Kabuterimon, it has combat abilities that far exceed those of similar species that inhabit File Island. 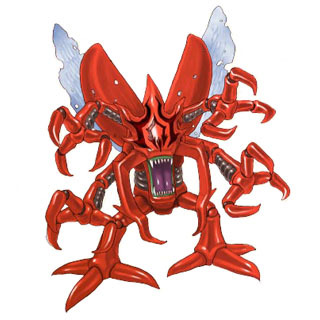 It is protected by its tenacious power and sturdy shell, and in particular, as the power of its pincers is super-powerful, once it clamps an enemy it will squeeze until the opponent's life is extinguished. There is a perfect rivalry between it and the Vaccine-attribute Kabuterimon, and there is only "Conflict" between them. Its Special Move is able to easily cut hard substances to pieces (Scissor Arms). Although it instinctively regards Vaccine-species as its enemies, it has gone even as far as treating Data-species as its enemies and swoops down on them, and its nature as a Virus-species has become more intense. 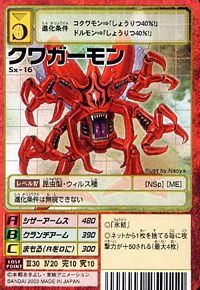 It came to prefer ravenous fighting styles such as acquiring its Special Move "Crunch Arm", in which it minces and injures the enemy with its feet, which have sharply increased in power, and then aims at their wounds to deliver a fatal blow with the pincers on its head. Although it innstinctively treats Vaccine-species as its enemies, it swoops down even on Data-species, demonstrating its frenzied nature. Special Move: Injures the enemy with its feet, which have sharply increased in power, and then aims at their wounds (Crunch Arm). n., Short for Kuwagatamushi 「鍬形虫 (クワガタムシ)」, which means stag beetle. Scissor Arms  シザーアームズ Shizā Āmuzu Easily cuts hard substances to pieces. 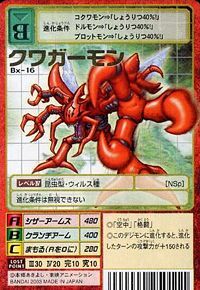 Crunch Arm  クランチアーム Kuranchi Āmu Minces and injures the enemy with its feet, and then aims at their wounds to deliver a fatal blow with the pincers on its head. 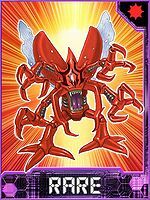 Kuwagamon X-Antibody is only obtainable as a collectible card. 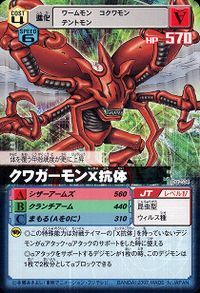 Its card is part of the Kuwaga Nine (クワガーナイン Kuwagā Nain) set. Evolves from Agumon X-Antibody or DORUmon. Can evolve to DORUguremon, Mega Seadramon X-Antibody, or Okuwamon X-Antibody. The hardness of the shell that covers its body has been raised even further.